What are the rules about dogs in bars? Health Department regulations against canine companions are more bark than bite. The dog photo that ran with our recent story on tap rooms sparked comments that could best be summed up as either “How cute is that dog?” or “How dare someone bring a dog to a bar?” So what are the rules for having your dog keep you company while you have a cold one on a bar stool? And where are the favorite hangouts for dog owners? We addressed those questions this week. Q: You can’t bring pets into bars and restaurants, can you? Now, enforcing that is another thing. For one, by law, the bar manager cannot ask if a customer has a disability. The bar manager, though, can ask if the dog is a service animal, and what task it performs. Customers are not required to carry their dog’s certification or show it to the bar manager, since there is no universal certification in place. Not to mention that the Health Department cannot cite the bar unless one of its inspectors witnesses the non-service animal in the bar. It’s a law that seems to have more bark than bite. Since January 2016, there have been at least three Seattle food establishments cited for having a pet on the premises. Health Department spokeswoman Lindsay Bosslet said there could be more pet violations, but that it’s hard to confirm since a rodent or cockroach problem is classified under the same animal health-code violation. A pet citation seems to be a minor violation. Bosslet disagreed with that characterization but said a pet violation alone is not enough to shut down a bar. However, the Health Department has a broad definition of “food establishments,” which include wineries and breweries that don’t operate a restaurant under the same roof. If you are offended by the presence of a pet in a bar, Bosslet recommended you bring it up with the bar manager. If the owner does not take any action, you are encouraged to report it to the Health Department, which will follow up on the complaint. Q: In your story, you mentioned The Brewmaster’s Taproom as one of the most popular dog-friendly places to hang out. But that’s in Renton. What about Seattle? A:Norm’s Eatery & Ale House in Fremont is a popular hangout with dog owners. The Hop and Hound in Bothell is a big hit in the North End. But really, brewery tap rooms, with their concrete floors and large beer gardens, are the most popular dog venues these days. A Washington Beer Commission spokesman said that the commission has found many of the 360 breweries in the state to be dog-friendly as well as kid-friendly. 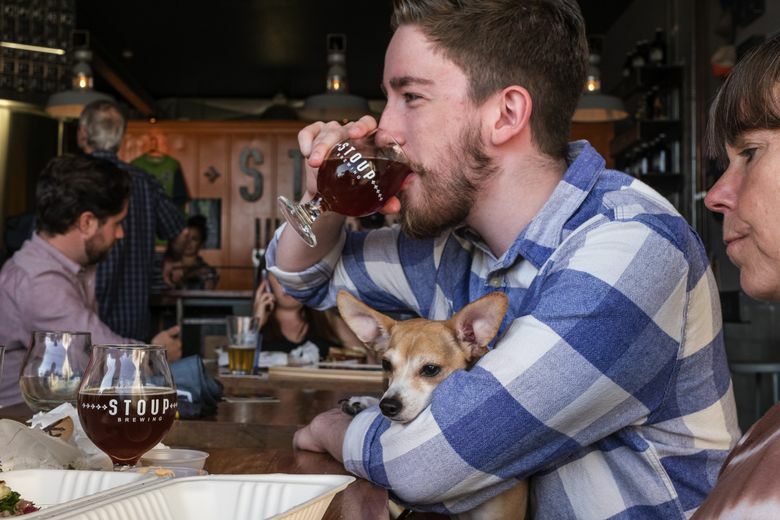 For instance, Stoup Brewing, Reuben’s Brews and Populuxe Brewing make up one of the most dog-friendly hubs in the city. For other breweries, call or check the brewery website first before bringing your dog to make sure it’s allowed.